Scientists from North Carolina State University, Sandia National Laboratories, and the University of California, San Diego have developed new technology that enables doctors to detect real-time chemical changes in the body and to do so continuously for an extended period of time. Microneedles are very small needles in which at least one dimension –- such as length –- is less than one millimeter. 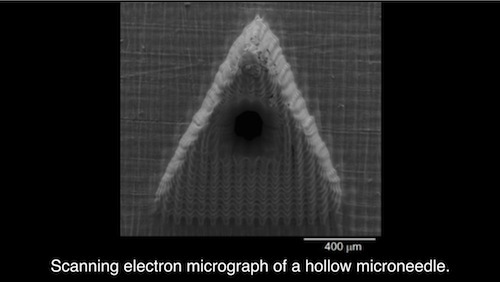 Existing technology depends on taking samples and testing them; microneedle biosensors instead allow for continuous monitoring in real time. The sensors are currently designed to detect glucose, pH levels and lactate. The research was recently published online in the journal Talanta. EZ Vein is designed to ease the sometimes tricky job of inserting an intravenous catheter. The noninvasive device includes an inflation cuff that goes over the arm to redirect blood from deep tissue to the target vein near the skin’s surface to make more visible and accessible to a needle. The medical device was invented by Dr. Robert Perry, a resident at Oklahoma University Medical Center. EZ Vein is so practical that federal regulators approved it in just 17 days. It was kind of a surprise. I wasn’t anticipating getting anything back until January, and I got it in October. Mobile technology company Qualcomm announced today the formation of a new subsidiary, Qualcomm Life. The subsidiary will run the company’s former Wireless Health business. Qualcomm Life was unveiled today at the mHealth Summit in Washington D.C. As part of the launch, Qualcomm presented the 2net hub, a mobile device designed to plug into a wall socket and provide connectivity for a wide range of medical devices. The 2net platform allows for the wireless transmission of health data from medical devices to various locations, such as a hospital or doctor’s office. Over 40 medical device manufacturers, application developers, health care services companies and payors are either integrating with or considering the 2net ecosystem. Qualcomm Life will also establish a $100 million fund, managed by Qualcomm’s venture arm, to invest in wireless technology adoption in the healthcare industry. Desired developments include biosensors, medication compliance, wellness, remote diagnosis or monitoring and analytics. Qualcomm Life was founded, in part, to assist medical device manufacturers who approached Qualcomm for help when their own wireless connectivity attempts became untenable due to technology selection errors, unscalable deployment models and prohibitively high operational support costs. Our services, including integration on the 2net platform, remove the burden for medical device manufacturers of a large technical development effort, providing integration with mobile carriers and solving the operational complexities of supporting wireless medical device data in the field.